The red bellied woodpecker has a bit of a deceiving name. It is a pale white, medium-sized woodpecker, with only the slightest red tint to its belly. It does, however, have a very distinctive round, red head, with black and white barred wings. The males have red on the entire head while the female red bellied woodpecker is red only on the neck. This bird is often confused with the red headed woodpecker, which is a much rarer bird with different wing patterns. Adult red bellied woodpeckers weigh about 72 grams, with the males being eight to nine percent larger than the females. They have two toes that face forward and two toes that face back, making them zygodactylous and unlike most other birds which have three toes that face forward and only one toe facing back. Red bellied woodpeckers have a distinctive rolling call that is easy to identify. They are a very vocal species, especially during spring and summer and have about six different communication calls. You can watch and listen for these birds year round as they do not migrate, although populations located very far north have a tendency to move south during exceptionally cold winters. You can listen to the different red bellied woodpecker call sounds here. 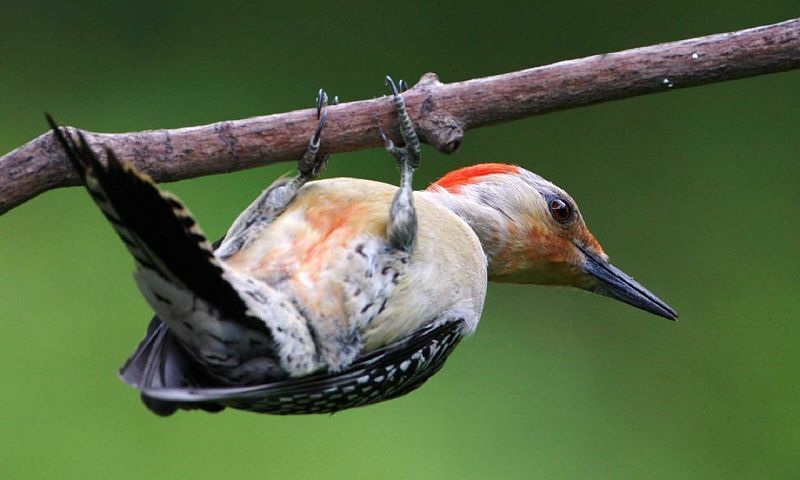 The red bellied woodpecker is native to the Eastern U.S. typically preferring humid forests filled with large old stands of oak trees and hickory as well as young hardwoods and pines. This woodpecker is more often found near river bottoms and wetlands and generally stays below 2,000 feet in elevation. In the southern U.S., red bellied woodpeckers are the most common woodpeckers, while they are much less abundant in the northern portions of their range. In south Florida, the population looks a little different from the rest of the U.S. with all black central tail feathers and a smaller, less white tail. Their white wing patches are also smaller and the males often have a brown forehead. In addition, their call can be a little higher pitched and have a slower roll than the northern populations. Red bellied woodpeckers are also common at backyard feeders and are particularly drawn to suet, peanuts, and sunflower seeds. These birds have even been known to drink from hummingbird feeders and will push just about any other bird away from feeders except for blue jays. Red bellied woodpeckers have the ability to extend their tongue nearly two inches past the end of their beaks making it easy for them to steal from hummingbird feeders. Their tongues are also barbed and their saliva is sticky allowing them to probe deep into various nooks and crannies for food. Males have a bit longer, wider tongue than the females and scientists speculate that this may allow the males and females to forage in different places within the same territory when they are breeding, making it easier for both to find food. Unlike most woodpeckers, this species tends to pick at bark rather than drilling into it. They don’t excavate holes but instead spend their time foraging for fruit, seeds, and insects closer to the surface of the tree. Their diet mainly consists of spiders and insects, but they also have an affinity for acorns, pine cones, and berries. They have also been known to eat lizards, nestling birds, and small minnows. These woodpeckers have a habit of cramming seeds and nuts into crevices to break apart into smaller pieces with their beaks. In addition, they will store food in tree bark, fence posts, and other small openings to use throughout the year. Nesting is a particularly tumultuous time for the red bellied woodpecker. They nest in crevices and holes in trees, and if they can’t find an open hole or don’t want to make their own, they will kick out other nesting birds. The endangered red cockaded woodpeckers are often targeted by red bellied woodpeckers and are forced to give up their nests. However, in some areas, starlings invade almost half of all red bellied woodpecker nests. Typically, the males choose the nesting site and begin excavating the hole in dead trees, fence posts, or other dead wood. They will attract females to the nest by calling and lightly tapping around the entrance with their beaks. When the female accepts his call, she will join him in tapping in and around the cavity and help him finalize the nest. These woodpeckers will use the wood chips created during their excavation as bedding for the eggs. The nests are usually about 22 to 32 centimeters deep with the inside cavity measuring around nine by 13 centimeters. Often, the pair will nest in the same location every year but rarely uses the same hole. Typically they construct a new one just below the previous year’s nest. The pair will have between two and six eggs, laying one egg a day, and have up to three broods in a season. The eggs take around 12 days to hatch and the babies are born naked with their eyes closed. The young birds remain in the nest for another 24 to 27 days but may stick around the parents for up to 10 weeks after to learn to forage. Occasionally, red bellied woodpeckers are seen displaying odd flight behaviors, flitting quickly between trees and changing directions suddenly. Scientists believe this may be a way for the parents to teach their young evasive flight maneuvers. Red bellied woodpeckers are considered of least concern and their population has been steadily increasing for the last 50 years. Estimates suggest a breeding population of 10 million with 100 percent of that population located in the U.S. The red bellied woodpecker has slowly been expanding its territory north and west for the last 100 years. Hey Buddy!, I found this information for you: "The Red Bellied Woodpecker". 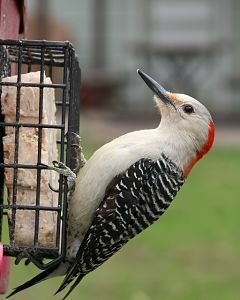 Here is the website link: http://backyardbirdingblog.com/red-bellied-woodpecker/. Thank you.